For more than 25 years, Caryn Hartglass has been helping people put healthy eating into ACTION. Now, she’s offering a limited number of spaces in her PRIVATE COACHING PROGRAM where she will provide one-on-one, private coaching sessions by phone or Skype. In these sessions you can get support wherever you need it, as Caryn will personally help you activate your healthy eating vision. • One-on-one, 45-minute sessions devoted to supporting you. • Direct email access to Caryn for questions, concerns and needs between sessions. • Judgement-free inspiration to stay positive and focused in your commitment. • Assessment and clarification of what works for you: for your body; your lifestyle; your schedule. After Caryn was diagnosed with advanced ovarian cancer with a 10-20% survival rate she dug deep to discover what she needed to do to survive and thrive and determined how to put what she learned into action. Caryn believes in what she does and is living proof of what is possible. ARE YOU AWARE OF THE FOODS THAT MAKE YOU FEEL GOOD & ENERGIZED? ARE YOU AWARE OF THE FOODS THAT MAKE YOU FEEL SLUGGISH? DO YOU KNOW WHAT FOODS YOU GRAB WHEN YOU ARE TIRED OR STRESSED? Caryn will help make the connections between how you feel and what you are eating and provide ways to develop healthier habits and make more optimal food choices for YOU. At the end of each session, Caryn will give you things to think about to guide you in your journey. She may recommend recipes, books, videos, or any other tools that can help you to reach your specific goals and overcome your unique challenges. No one way of eating works for everyone. Caryn will take into consideration your health history, your current food routine, your dietary needs, the foods you like, the foods you don’t like and create a personalized plan with you that will work for you. Before the coaching begins you’ll be asked to fill out a form and answer questions to gather information about you, your lifestyle, your health goals, your food likes and dislikes, along with any allergies or sensitivities you may have. Your coaching sessions will be more effective as a result. 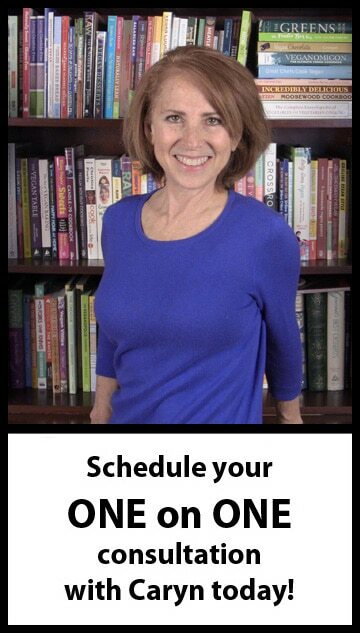 Find out more about Caryn’s PRIVATE COACHING PROGRAM. Send an email to info@realmeals.org with your name and a brief explanation of what you hope to achieve with coaching. Caryn Hartglass holds Bachelor and Master of Science degrees in Chemical Engineering from Bucknell University. She recently obtained the Plant Based Nutrition Certificate from eCornell and T. Colin Campbell Center for Nutrition Studies, and the Food Protection Certificate from the New York City Department of Health and Mental Hygiene. Caryn is passionate about helping people understand the effects of food choices on health and environment. She is the co-founder of the nonprofit organization Responsible Eating And Living (REAL) which delivers easy to use, factual information and services, providing inspiration to take responsibility to nourish, protect and support ourselves, our families and the Earth with whole, plant-based foods and planet-friendly products. Caryn is also the co-director of the Healthy Kitchen and Plant-Powered & Thriving 6-week online course programs at the Food Revolution Network with Ocean and John Robbins. Prior to REAL, Caryn was the Executive Director of EarthSave International. An ovarian cancer survivor, Caryn combines science with practical knowledge from real life experiences lecturing around the world about the powerful, healing benefits of a plant-based diet, juicing and meditation. She has appeared on Dr. Oz, Geraldo At Large, 20-20 and CNN, and currently hosts the weekly It’s All About Food show on the Progressive Radio Network. Prior to her work in plant-based nutrition, health and wellness, Caryn worked as an engineer in the semiconductor industry for 20 years. Caryn is a classically trained singer and performs in opera and musicals in the United States and abroad. She has won two international voice competitions (France, South Africa). Caryn lives with her partner Gary De Mattei who is the co-founder of Responsible Eating And Living. Together they created Hartglass & De Mattei, The Swingin’ Gourmets, the first vegan cabaret musical. Caryn is a contributor to 25 Women Who Survived Cancer: Notable Women Share Inspiring Stories of Hope, published by Sellers Publishing, September 2016. Other contributors include Robin Roberts, Fran Drescher, Patti LuPone, Alice Hoffman, Sylvia McNair, Barbara Padilla, Marissa Jaret Winokur, and Liz Lange. All royalties will be donated to cancer research and prevention.